In the episode 6 of Love Rain On April 10th, 2012, Jang Geun Guk (Seo Joon) and Yoona (Ha Na) encounter by chance in Japan. Although the two persons who meet for the first time because of a forgotten cell phone constantly have small conflict, but their relationship warm up rapidly, the mood is wonderful beyond words. 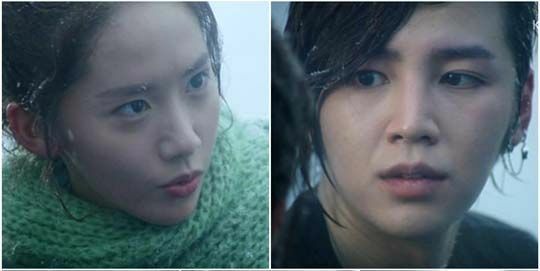 Jang Geun Suk and Yoona who almost frozen into ice when buried in the snow go to the hot springs together. There, Jang Geun Suk also tells Yoona the secret of courting female. In this regard, Yoona said, “My mother hasn’t forgotten her first love for life, because that kind of memory let her feels happy, I also want that kind of love.” Then she turns around, looking teasingly at Jang Geun Suk and counted, “1 second, 2 second, 3 second.” At the moment Jang Geun Suk looks at her the heartbeat intensified, then he hugs Yoona tightly. After been rejected by Yoona, he looks at her affectionately, and approaching her gradually, wanting to kiss her. But at this moment, they’re interrupted by the staff rushed in, and the kiss does not materialize. After the episode aired, the audience gave different reviews, “Comparing with Jang Geun Suk, Yoona is more like a playgirl, her 3-second eyes are too seducing,” “The 3-second eyes of Yoona is charming,” “Nobody could stand the 3-second gaze by Yoona” and so on. In addition, in episode 6, Jang Geun Suk and Yoona do not make their hearts known, instead a lot of misunderstandings arisen, and they meet again in Korea. The ratings for the episode 6 have since rebounded slightly by 0.5% to 5.9%.